From the rotary engines of the early 20th century, to the advanced jet engines of today, the course of aviation history has been marked by numerous innovations in engine technology. Here are just 5 engines that left their mark in aviation history. The heavy 12-horsepower engine with dual propellers powered man’s first documented flight in Kitty Hawk, North Carolina. Built by Charlie Taylor, Orville and Wilbur Wright’s trusted bicycle repairman, this historic engine was cast from 92% aluminum and 8% copper. It had no spark plugs and included a bicycle chain that turned the camshaft to operate the breaker arms and exhaust valves. Although it overheated on a test run in February 1903, the engine underwent improvements throughout the year and was finally used in the Wright’s first flight in December 1903 . Developed before there was a plane to fly it, the PR R2800 has 2,800 cubic inches of displacement and a two-stage supercharger that provides maximum high and low altitude performance. 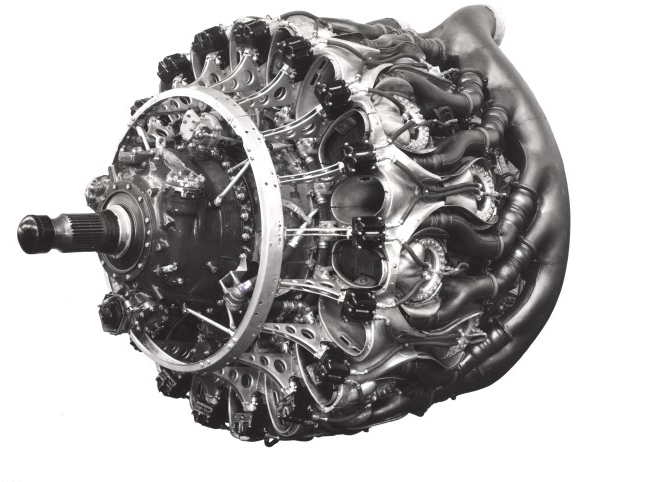 This 18-cylinder radial engine was eventually used on planes that led many successful air campaigns during WWII like the Vought F4U Corsair, Republic P-47 Thunderbolt, and the Grumman F6F Hellcat. As the powerhouse behind the Korean War’s most used bomber, the B-29, the Corncob 4360 was a work of wonder. It was the biggest reciprocating radial engine built in the United States at the time with 28 cylinders and a mechanical supercharger. It helped fly the U.S Air Force’s Globemaster, and it powered United Airlines’ Stratocruiser from San Francisco to Hawaii. The J58’s record breaking speed powered the world’s first high-speed spy plane, the SR-71 Blackbird. In one second at high speed and altitude two J-58s take in 2.2 gallons of fuel and 200,000 cubic feet of air. As the SR-71 flies, the engines grow 6 inches in length and 2.5 inches in diameter. It’s also the only engine that flies with the afterburner on all the time! With its three stages of compression and distinctive scalloped cowlings, the Dreamliner’s Rolls Royce engine is the quietest engine created thus far. Released in 2014, the engine provides up to 119,000 lbs. of thrust, enough to transport up to 290 passengers across approximately 7,000 nmi (13,000 km). Visit us today to see more history-making engines!